By LUDWIG VON KOOPA - The newsletter that's the most review-iest of all-time newsletters. As much as I like treats, I don't like tricks, so I'm not going to sugarcoat this newsletter by acting like our November 2018 was as good as it could be. November 2018 was defined by KoopaTV's new publishing schedule that began on November 12. Let's get right into what happened. Since Monday November 12, each of the five KoopaTV staffers were given a weekday to publish something. That was three full weeks in November, so there should have been 15 articles. What happened? Six out of fifteen isn't good. 40%! Well, two staffers failed the “Kamek test.” Everyone has their reasons (well, one staffer has no reason) despite everyone agreeing to the schedule. Rather than me blaming the other KoopaTV staff members (although you are all more than welcome to do so in the comments section!) 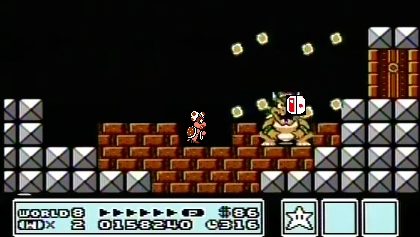 in this newsletter, here's what we're going to do to fix things and finish the year strong in the most anticipated time period for a Nintendo fan since E3 2018. Wendy O. Koopa keeps saying her floors are broken or something. She actually bought a Nintendo Switch, but her room is falling apart. I guess that's an excuse? I wonder what's going on. ...To be honest, we haven't actually thought of a long-term solution yet that maximises and balances our happiness and your happiness. The average KoopaTV staffer wants flexibility to create great content. Flexibility being “publish whenever they feel like it.” The average KoopaTV player wants a consistent flow of new, quality content about different topics from a diverse set of perspectives. We'll try the “publish whenever we feel like it” method for the rest of the month, but we're definitely open to your suggestions! With Super Smash Bros. Ultimate imminent, we'll have things to talk about, but we might not feel like talking about it because we'd rather be playing games. Quite the conundrum. But even after that, looking into 2019, what do YOU think we should do? KoopaTV is Hiring! And Accepting Guest Posts! I know that past heading doesn't make us seem like we know what we're doing, but if you look behind the scenes, we're a fun bunch. And this weekend we're going to our Sierra Leone headquarters for a big Super Smash Bros. Ultimate launch party. Want to join us before that happens? Then familiarise yourself with our Hiring page! There's easy but specific directions contained there about how to join KoopaTV, along with benefits! KoopaTV's Super Smash Bros. Ultimate November Direct Live Reactions — Internally hyped as the most important Direct in history, all of our staff members participated in this reveal-all Direct of Super Smash Bros. Ultimate. This reaction log isn't great just because of the Direct itself, but it's also great because of all of the circumstances and storylines all the staffers were going through during it. Welcome Piranha Plant and Koopa Paratroopa to the Spotlight! — I'm saying great things about Piranha Plant for being in Super Smash Bros. Ultimate, and Koopa Paratroopa for being in Mario Tennis Aces. They're showing off their skills and I love it. The Best Chip Dip From A Guy With Teeth Not Made For Crunching Chips: Splatoon 2 Splatfest — Ludwig discusses chip-dipping philosophies (salsa or guacamole? Is double dipping okay?) for the Splatfest, including personal stories regarding his own chip-eating experiences. With pictures! Witch Princess and the Potion — Witch Princess's first short story on KoopaTV, featuring her mischievously screwing over an impatient farmer. But you'll only screw yourself over if you don't read it and enjoy yourself! Every article is worth... EXPERIENCING! Even the ones not on that list. Lots of good comments. Well, in terms of proportionality. In terms of sheer volume, there weren't many comments on the site in November, which is really bad given which KoopaTV Loyalty Rewards round it is. I'm sort of sad that the Ludwig fan is a mere anonymous commentator though. (And sort of creeped out by the emojis.) Would be nice to see them around more. But as for someone who is around more, ShinyGirafarig made probably the best point of the whole month, and it's relating to the terror of Daylight Savings Time and its effects on the young. I like comments on old articles (unless they are just remarking how old the article is), but this guy is obviously demented and senile and probably offended by how I spoke poorly of Electronic Arts five and a half years ago. Given the recent George deaths in the news, I wouldn't put it past reality that the George who commented this is now deceased. But KoopaTV will not cease providing the truth about someone even if they're dead, and the truth is that George's comment is awful. In the October 2018 review newsletter, I incorrectly summarised one of the top 5 recommended articles for October 2018 by using the opposite Splatfest team that I meant to name. This was pointed out by ShinyGirafarig, and she got three points for it since making the exact opposite point I'm supposed to is a rather critical error! Round 23 is November 1 to December 30, 11:59 PM Eastern. Plus, a random drawing for another $10 Nintendo eShop code. Learn how to participate and get points in this handy table of point-getting activities! Comments? Questions? Concerns? Suggestions? Even for those things that aren't comments, put them all in the comments section, and a KoopaTV staffer will get back to you. (Also known as Ludwig.) Even if you have nothing to say directly to the staff, just sharing KoopaTV to other people helps KoopaTV as well! Don't you want to help KoopaTV? Since a big part of this newsletter was about the publishing format previously announced in last month's October newsletter, you should read that newsletter too. Next month is December 2018's newsletter, and it's at least higher quality. Ludwig is jealous of how much shinier and positive the November 2017 newsletter was a year ago. ...Honestly I don't see there being a problem. I mean, NONE of you get paid right? So why not just write articles when you feel like it? I can't speak for others but I've personally never saw a need to complain. Uhhhhhhhhhhhh Rawk literally just published articles without anyone looking at them beforeclaw or telling anyone that those would be a thing...! Oh, and yes, none of us get paid since KoopaTV makes no revenue since we're ad-free and don't do any affiliate programmes or anything. Don't follow-up asking what this press release was about. Actually, after suspecting that Ludwig would at last call attention to the previous publishing schedule's failures and then reluctantly kill it off (pssst...everyone had wanted it dead but him! ), I decided I'd make the Tuesday in which I was finally not even *remotely* expected to do anything into one of the most prolific days in KoopaTV history. In terms of ironic theatre I think it truly takes the angel food crazy cakes. Since you linked the Salsa article i want to let you know I got my internet back up and running at the new place but still need to work on the kitchen (as well as everywhere else) so the homemade salsa is going to be delayed. Welcome back online, at least. So you won't get us the salsa in time for Super Smash Bros. Ultimate? Damn.